Before I moved to Spain I worked in an office job in England for nearly 2 years after finishing University—and this was two years too many for me. Sitting at home in Manchester with the constant rain, clouds and freezing cold days was not what I had envisaged for my life. I wanted to travel, to explore the world and do something that made me happy. I wanted my job to be something that made me laugh every day, something where I could come home at night and tell my friends an interesting story, a job where I was constantly learning. I had no clue what adventures around Spain were awaiting for me. This is why teaching appealed to me, and it hasn’t disappointed me yet. So, with this sorted all I needed to do was to pick a place to teach. I’d always wanted to learn Spanish and from what I’d seen of Spanish weather how could I go wrong? I moved to Madrid without ever having visited the city before. I’d been to Barcelona and some of the typical touristy Costas and I figured I understood Spain and its culture—if I liked those places, I’d like Madrid. Of course now I am completely in love with Madrid but I couldn’t have been more wrong in my assumptions. Madrid is enormously different to Barcelona, Alicante, and all the other places I’d previously visited in so many ways. My preconceived ideas of Spain were smashed in my first few days of exploring. I couldn’t get enough. Everywhere I went I discovered new traditions, new food, new drinks (tinto de verano will forever be my drink of choice, and is far superior to the sangria I thought I loved), new cultures (staying out until 7am and botellón in particular are my favorites), amongst so many other things. Talking to my students I quickly learnt that this was not something specific to Madrid. Every town, every city, even every village was so unique and incredibly different. Within a few weeks I had an impossibly long list of places to go and things to do all over the country. Not long after I arrived we started a new year and I decided that my resolution for 2012 would be to visit one new city, town or village every month. It was possibly the best resolution I have ever made and I convinced my friends to do it too. We had the most incredible year. big cities such as Valencia, where we combined eating mouth-watering paella with plenty of sightseeing and lots of history (as told to us by our free-walking tour guide). 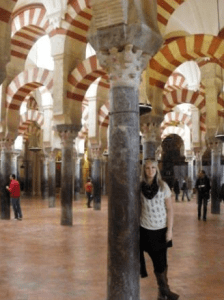 Mind-blowingly beautiful places such as Granada or Córdoba where we felt like we had stepped back in time and where the combination of cultures, architecture and religions was fascinating. beaches such as those in Cádiz where we relaxed and soaked up the sun while enjoying the local delicacies, and of course a few glasses of tinto de verano. places like Málaga which surprised us with their traditions and customs–seeing one hundred or more men carrying gigantic tronos (religious idols) through the street was something really special, not to mention the way everyone was dressed. 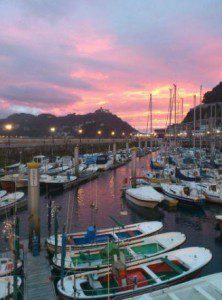 San Sebastián, which I cannot recommend highly enough, if only for the food. Without a doubt some of the best food in the world–AND with gorgeous beaches, architecture places to visit. tiny local villages like Alcalá de Hernares where we saw Cervantes’s birthplace and got to choose which delicious tapas would come free with our drinks. I could continue this list for a long time but it’s something you need to discover yourself. We learnt so much about Spain in that year and I couldn’t have believed most of it unless I’d experienced it for myself. It’s an incredibly diverse country in almost every way which never fails to surprise me and one which I feel I will never finish exploring.